New Happy Hotel is located in the vibrant Geylang District, a 15-minute walk from Aljunied MRT Station. It offers modern and affordable accommodation with free parking and free Wi-Fi. Cosy guestrooms feature wooden flooring and modern furnishings. Each room is equipped with cable TV and a hairdryer. Hotel New Happy has a 24-hour front desk to tend to guests’ needs. The hotel can also assist with tour arrangements and travel information. 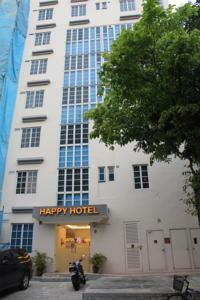 New Happy Hotel is surrounded by many known eateries in Geylang. It is a 20-minute drive from Changi International Airport and a 15-minute drive from popular Orchard Road. Visa, Euro/Mastercard, Diners Club The hotel reserves the right to pre-authorise credit cards prior to arrival.